The good news is that our God is speaking today. He spoke in times past through the prophets. 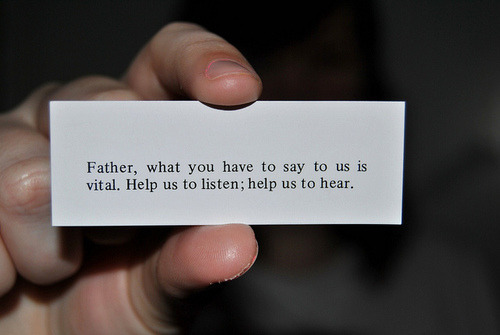 He speaks today through His Son, Jesus Christ. He also speaks through the Holy Spirit and His messengers. “The words that I speak to you,” says Christ, “are spirit, and they are life” (John 6:63). Oh, dear friends, the greatest force in the universe today is the Word of God! But the sad news is that the American church for so long has not had an ear to hear the voice of God. There has been a dullness of hearing. We have listened to siren voices distracting from the voice of our Good Shepherd. Could it be that now for the past ten or fifteen years American Christians have been coming out of their slumber enough to start hearing what God is saying? But let’s be realistic: we have not been fully awakened as yet. We have not seen full-scale revival in our land. There is still complacency, division, prejudice, materialism, cynicism, arrogance and carnality in most of the body of Christ. No, we have not come to revival — not yet. But — praise God! — something is happening. Even though most American evangelicals are still asleep, some are waking up. Most of us are still in our nightclothes, even still in our bedrooms. But we do hear something and we’re afraid to go back to sleep, knowing that we’ll miss the mighty call of the Spirit. We now have an awareness to some degree of the spiritual stupor from which we are emerging. We are developing an ear for the Spirit’s startling revelation that we have been infected with the Laodicean Syndrome. We are ashamed that we have invested so heavily in false values, that we have boasted of being whole and having need of nothing, when Christ has seen us as wretched, miserable, poor, blind and naked (Rev. 3:17). We’ve mistaken our material prosperity for divine approval. We’ve grown blind to our self-righteousness, pride, prejudices and conceit. We’ve been insensitive to the movements of God and to the lateness of the hour. We’ve been so far from God, and so taken up with ourselves, that we have not discerned His voice and we’ve tried to write off His messengers while ignoring His message. But we are now at the critical point — will we humble ourselves and let the Lord touch our ears to hear? Will we receive from the Lord the true wealth, the gold refined in the fire? Oh, dear ones, let us reach for the garments that He offers, while we rend our old ones — let us cherish the white robe from Him, the only covering for the shame of our nakedness! Let’s submit to His ministry to our eyes — we need His eyesalve to anoint our eyes that we may see. Let us tune out all distracting voices and beg for an ear to hear what the Spirit is saying to the churches at this hour. I’m convinced that God is saying at least three things to His Church as we close out the twentieth century. Consider these three urgent calls prayerfully and seriously, and see if you agree, and then act accordingly. I believe that God is saying, Wake up and prepare for the great revival that I am going to give. The most crucial time in revival is at the earliest stage when the Spirit is rousing a Christian or a congregation to its slumber and penetrates just enough to bring about an awareness of their plight of deadness. A critical decision has to be made about waking up, coming fully awake and receiving the whole truth about our undoneness and desperate need as God will reveal it. This is what we say that revival is first a rude awakening before it is a great awakening. Preparation includes humility, repentance and prayer (II Chron. 7:14). Have you ever noticed how frequently God’s Word calls attention to the need of humility on the part of God’s people? “God resists the proud, but gives grace to the humble. … Humble yourselves in the sight of the Lord, and He will lift you up” (James 4:6, 10). The angel Gabriel told Daniel, whose prayers initiated a great war in the heavenlies, that it was when he began to humble himself before the Lord that his prayers were heard (Dan. 10:12). Even our Lord humbled himself before the Father in prayer, before John the Baptist in baptism, and submitted Himself to the humiliating attacks of Satan. But the consequences are reported: “Jesus returned in the power of the Spirit to Galilee, and news of Him went out through all the surrounding region” (Luke 4:14). In Capernaum “they were astonished at His teaching, for His word was with authority” (Luke 4:32). If we’ll humble ourselves, God will continue to speak to us and show us what we need to repent of and how we can more completely prepare for the revival He wants to give. I believe that God is also saying, Get up and prepare for the abundant harvest you’re going to reap. Revival is not an end in itself. God revives His people and restores them to New Testament power in order that the church might reap a harvest of souls. Even as God is preparing His people for the great awakening He is preparing the world for hearing the Gospel. Never in the history of mankind have so many millions become so hungry and receptive to the Gospel of Jesus Christ. The times in which we live offer the greatest opportunities in the history of the church. Jesus Himself said, “And this Gospel of the kingdom will be preached in all the world as a witness to all the nations, and then the end will come” (Matt. 24:14). Whatever we may believe about the end times, we can count on one thing: the end will not come until Jesus’ vision of a worldwide evangelistic impact of the Gospel takes place. So let the church wake up and prepare. Let’s have a spiritual housecleaning of our hearts and homes and churches and communities, and get ready for the revival God wants to give. Let’s get up and prepare to enter the harvest. A lost world must be touched lovingly, redemptively and personally. This will take love, obedience, time, money and hard work. But God puts the premium on people, and they are all around us needing our love and the Gospel of Christ. Finally, I am convinced that God is saying, Look up and prepare for the Lord’s return and the account that you must give! I believe we Christians have biblical grounds for believing that the Lord shall return even as His church and the world are engulfed in great sweeping revivals and global thrusts of a glorious witness of the Gospel to the nations, all this at the most dangerous time in human history. Put it down, my friend, the church age will end with a bang and not a whimper! Our Christ the Coming One is also the Conquering One. And it is to Him that each one of us must give an account. I’ve been thinking about some serious issues that must have already been reckoned with before I stand at the Judgment Seat of Christ where the stewardship of all believers will be reviewed and rewarded accordingly. God forbid that I shall have slept through the greatest spiritual awakening in the history of the Church! God forbid that I shall have muddled through my Christian life in the weakness of the flesh and missed the sanctifying, fulfilling power of the Holy Spirit! God forbid that I shall have remained ignorant of the amazing power of prayer for spiritual warfare and advancing the Kingdom of God! God forbid that I shall have attended only to my selfish interests and ignored the hurts and needs of others only to learn too late that I had ignored the hurts and needs of the Lord Jesus Christ Himself! God forbid that I shall have gained the world of material things and thrown eternity away! God forbid that I through ignorance, fear or preoccupation should fail to win others to Christ while in this life and thus stand empty-handed in that Day! God forbid that I should allow anyone or anything to distract my full attention from Jesus Christ, the author and finisher of my faith. May I be found in Him, not having my own righteousness, but that which is through faith in Christ, the righteousness which is from God by faith; that I may know Him and the power of His resurrection, and the fellowship of His sufferings, being conformed to His death. So may I press toward the goal for the prize of the upward call of God in Christ Jesus! This entry was posted in Christian Renewal Journal and tagged awakening, Christ, eschatology, God, Gospel, Holy Spirit, humble, humility, Jesus, listen, Lord, Lord's return, prayer, repentance, revelation, revival, second coming. Bookmark the permalink.